The history of whist is ancient, albeit not so ancient compared to the history of card games such the italian scopone or tressette. In the history of whist, two ancestors can be traced: Ruffs and Honours, a card game played in England during the 17th century, and the more ancient Trump (played in 16th century England). Whist took from these card games the terms "trumps" and "honours", and is therefore fairly certain that whist originated in England. The history of whist is peculiar in the fact it didn't originate in the aristocracy and then became popular among the lowly people (like the italian card game tressette). Whist was born among the people, and then gained the favour of the aristocracy. However, the real history of whist begins with the popularity it obtained in England, during the 17th century. From England, whist went to France, where it spread at the court of Louis XV (1710-1744), thanks to the interest Madame du Barry (1746-1793) had in the card game of whist. 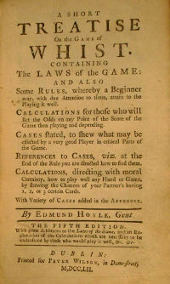 In 1742 Edmund Hoyle wrote a Short Treatise on whist, which represent the first codification of whist etiquette and rules, and contributed to the diffusion of the card game. During the Napoleonic Empire, Marie Louise of Austria (1791-1847), Joséphine Bonaparte (1763-1814) and Napoleon himself (during his exile) are said to have played whist. The history of whist continues, always including famous names, such as Talleyrand (1754-1838), who kept his mind in shape by playing whist. The history of whist goes on, and in 19th century Henry Jones (1831-1899) wrote a treatise(Les principes du Whist), which for the first time gave scientific dignity to whist card game. A new chapter in the history of whist begins when the card game lands in America thanks to Benjamin Franklin (1706-1790), who spread it in Philadelphia. There, whist left the private card rooms and spread in all of America with the first whist tournaments. In Russia whist was already known (as Russian Vit), but in 1886 a new variation of whist was born (later named Russian Whist), which spread in Middle-East countries. In Turkey, an italian from Neaples, Edoardo Graziani, who worked at the embassy in Constantinople, played a variation of Russian Whist (later known as Dummy Whist) with Giorgio Coronio (Constantinoples Bank manager). Maybe thanks to the bank employees, this variation of whist spread among the people, in particular among the sailors, who brought this variaton of whist to Cairo, French Riviera, Paris, and then in all of Europe. The first official tournament in the history of whist was held in 1893 in New York, where 4 years later an official set of tournament rules is published. However, the history of whist was about to come to an end, and in India were laid the foundations for a new card game: Bridge, which in time replaced whist. Its decline in 20th century notwhitstanding, whist is still popular in Great Britain. More importantly, today whist is experiencing a wide diffusion in a new form: online whist. Thanks to new technologies and media which for the first time enter the history of card games, a number of free online games sites are spawning, which let everyone play a game of online whist for free.